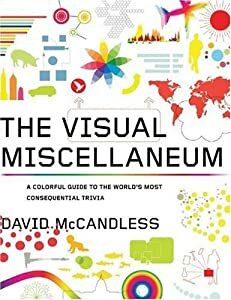 My previous post about a graph depicting some interesting cultural information in the form of a cool graph led me into more of David McCandless work and I highly recommend his The Visual Miscellaneum: A Colorful Guide To The World’s Most Consequential Trivia (US markets) or Information Is Beautiful (European markets). Do not opt for the Kindle version of the books, this is one book that you would love in paper. But ofcourse you don’t have to take my word for it, the TED talk by McCandless should give you a taste of what the book has in store. The book is a valuable read for students, scientists, designers and general creativity nuts. This is no Edward Tufte, visual information display book (and is not meant to be one) but it sure has plenty of appeal for the average curious soul.